Blu Moon can be used in hydroponics, soil, coco, or soilless applications. Blu Moon is made in small batches with only the purest, highest quality minerals so all gardeners can enjoy the most out of growing. 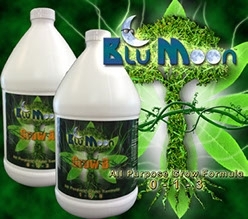 Blu Moon has stood up to all major nutrient lines and will outperform any of them side by side. Blu Moon delivers the best quality, performance and value of any nutrient on the market today. my nirvana raspberry cough girl! things are really taking off now coming into week 7! strawberry stretched a bit more then i like. but it always does. crystals are completely insane on these ladies! did my rotations and some cleaning up on lower branches to the coconut oil pile they go..expecting blue dream to finish first As i been growing her for many years now, and she usually finishes end of week 8,first round with black jack from nirvana and shes looking like a keeper!